It’s been a fantastic few days at the Apostolic Summit here at Rockhampton, the 20th Summit. The speakers were John Alley and Bob Hausleman. Bob Hauselman is the Senior Minister of Restoration Christian Church in Sellersburg, Indiana, and also the Apostle in charge of ARM Network. Both of these men are influential in their respective ministries, carrying a lot of spiritual authority but with great humility. We caught up with our favourite ex-Narrabri teenager, Choni Smith. Choni led us to the Rockhampton Zoo. This year we are staying at Rockhampton Serviced Apartments, in a renovated Church of Christ building now called “The Chapel”. It’s a four- bedroom apartment on Denham St, a very pleasant place. Tomorrow we head over to Rosslyn Bay for the Sons’ Retreat. This is a low key retreat for pastors and other ministers. It’s a great time of fellowship and encouragement. The sermon for May 21st 2017 is now available on the New Life web-site. In this sermon, which is based on Hebrews 3:4, Ps. Premnath Samuel from Chennai talks about letting God build the house of our life. If you ever watch those Customs shows and wonder why Australia is so tough on people bringing stuff into the country this might help. Slimy invaders from afar have long been a staple of science fiction, thrilling and chilling audiences. Slimy invaders as a fact of farming life are much less entertaining. Every season, before he starts seeding, Yorke Peninsula farmer Graham Hayes has to lay snail bait. If he doesn’t do so, his crop will be destroyed by millions of Mediterranean snails. “Well if they are in large enough numbers they’ll just eat all of the crop,” Mr Hayes said. Those “troubles” occur right across the growing period. In the early stages, while a crop is still green, Mr Hayes said the snails would eat it. CSIRO scientist Geoff Baker is Australia’s foremost snail expert, having spent three decades musing over the molluscs. He has warned this year has the potential to be a bumper snail season, for two main reasons — the recent wet and mild summer, and the snails’ ability to juggle their breeding cycles. 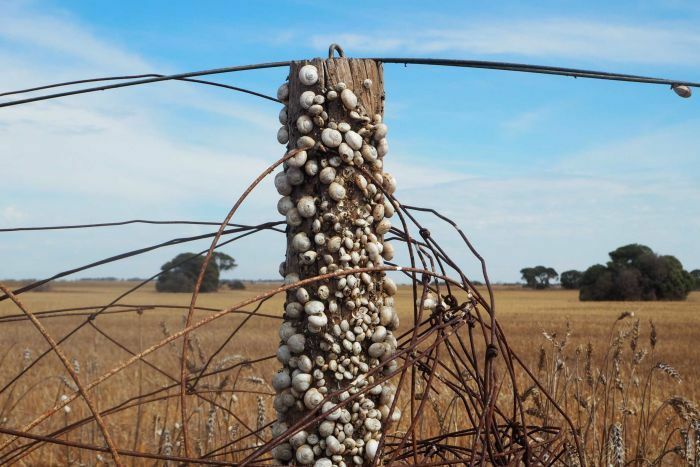 “This is a bet-hedging strategy that the snails use, and many other invertebrate animals use, where they’ll sit tight if the weather’s not great for reproducing or they’ll go gangbusters if it is great,” Dr Baker said. The snails arrived on Yorke Peninsula more than a century ago, as slippery stowaways aboard sailing ships coming to collect grain. Dr Baker said there were four distinct species of snail. Generically they are all called the Mediterranean snail because of where they originated. “They have distributions all the way from Scotland down to Morocco from Portugal through to the Middle East,” Dr Baker said. “So there’s a big, wide distribution, they’ve come accidentally to Australia and they’ve become a problem. Jesus tells the disciples that if they love Him they will obey His commands. He will send the Comforter, the Spirit of truth. The world cannot accept Him because the world does not know Him. Jesus is going, but because He lives we also will live. We will know the unity of the Father with the Son and with us. Often we fail to understand the true unity of the believer with God through the Holy Spirit. Jesus says that He is in the Father and also in us, and that we are in Him. To be born again is to be born of the Spirit. We share in Christ’s death and resurrection, and the Holy Spirit comes and dwells in us. There is a close unity within the person of God- Father, Son and Holy Spirit. When we are born again, we are brought into the union. No, this is about relationships. God invites us into a relational unity with Him that we were created for and which sin destroyed. Because I am now in God, I need to protect this unity through a commitment to holiness. I do not want to risk this unity by offending God’s perfect holiness. This would be like defiling my marriage relationship by sleeping with a woman other than my wife. We were created for a close relationship with God. Jesus died on the cross to restore the relationship. He gives us the Holy Spirit to be the centre of the relationship. Lord, this concept of being united with you is very hard to get my mind around. I don’t understand it, but I receive it. Please help me to repent and turn away from everything that would rob that relationship. Amen. In your hearts set apart Christ as Lord. Always be prepared to give an answer to everyone who asks you to give the reason for the hope that you have. But do this with gentleness and respect. Even if we suffer for doing what is right we are blessed. We should always be ready to give an answer for the hope we have in Christ, but with gentleness and respect. Christ died for our sins once for all to bring us to God. We was put to death but then raised to life by the Holy Spirit. He preached to spirits in prison who disobeyed long ago. Noah’s ark is a type of baptism, the pledge of a good conscience towards God. Evangelism starts with a heart dedicated and sanctified to the Lord. We must repent of sin and live a life that honours God. This does not mean we have to have it all together before we can share our faith. It does mean that Christ must be the highest priority, the most precious desire of our heart. Christ must be Lord in our hearts and not just the means to getting to heaven. We must be always prepared to give the reason for our hope. People ask questions about faith at all kinds of times- often at inconvenient times. Will we take hold of the opportunity as it presents itself, or fob off a seeker because we have other things on our mind? This must be done with gentleness and respect. People are not won by arguments and insults. They are won by humility, gentleness and respect. This person asking me about my faith is someone who was created in the image of God and for whom Christ died. Our faith sharing must always be done with this in mind. Lord, who are you leading me to talk to today, this week? Let my life, my attitudes and my words speak highly of you to all that I speak. Amen. Paul is in Athens where he has a dispute with some of the city’s philosophers. They take him to the Areopagus to present and argue for the Gospel. Paul notes that the city is very religious, even having an altar dedicated to an unknown god. Paul says that this is the true God who created all things and all people. He did this so that people would turn to Him and find Him. In the past, God overlooked the ignorance of paganism. But now He calls all people to repent, for He has set a day of judgement by Christ whom He raised from the dead. Some sneer at this talk of resurrection, but others believe Paul and his message. Since Christ came into the world, the gospel has left us with a stark choice- we can accept it or reject it. The commandment given to all people now is “repent.” The Kingdom of God has arrived, and we must turn from our sins and follow Jesus. There once was no kingdom, but now the King has come and established His Kingdom. Once we could live as we pleased, whether it was to worship idols or to worship our bodies. Now King Jesus tells us to worship only Him. There is a grace period but a day of judgement will come. Jesus is justified in judging those who reject Him. He died to pay for our sin. Now we must honour Him with our lives or pay the price for rejecting His grace. This is not religion by obeying rules. This is freedom to live the lives we were created for. I once was lost in sin, but now I am found in Him. Repenting does not just mean turning from sinful actions. It is letting go of all our false loves to embrace the true lover of our souls.